The original recipe called for pears, but apples were in season at my local market so I used them – with NO regrets! It was delicious! I also used gluten-free flour. Before baking. We at it all before I could get a photo of it AFTER baking! 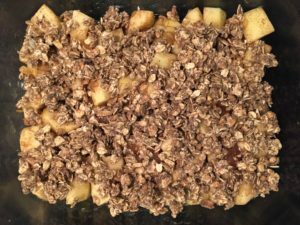 In a large bowl, gently toss together the pears/apples, brown sugar, ginger, orange zest, orange juice, flour, ground ginger, cinnamon, and nutmeg. Spread into a buttered 9″ x 13″ baking dish. Dollop about 2 T. of the dulce de luche spread evenly over the mixture. In a medium bowl, stir the oats, flour, sugar, and spices together. Using fingers, rub the butter into the mixture until it resembles a coarse meal. Sprinkle the topping over the filling. Bake until topping is light gold and filling is bubbly, about 20-25 minutes. Broil until the topping is a deep gold, 1-2 minutes. Serve warm with a dollop of yogurt and remaining dulche de leche on the side.